Larkins on the Lake is so perfect – it’s scary! 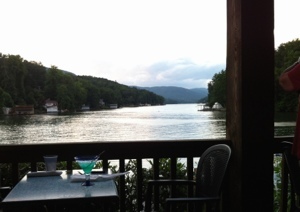 Ok – I hate to say this – but I liked Larkins on the Lake so much – I ate there 2 times in a row. I mean – how embarrassing is that for a high-end foodie? I’m completely guilty of what I complain about other people doing – staying with the safe and certain. Reviewing note – I officially might have been at the Bayfront (what they call the part of Larkin’s that closer to the dock) – because we sat outside to enjoy the breezes – but I was assured that the menu was the same. But you might ask when you go. In my defense – Larkin’s on the Lake is awesome. First off – the location. It hangs over Lake Lure – facing almost due West to catch the last rays of sunshine, a glorious sunset – and then you can admire the mountains in the distance. I mean – what’s wrong with that? And it was close (under 10 minutes) from our home base – so getting home after dinner – in the dark – was slow, but at least short. Given the number of deer we spotted either bounding up the sides of the road way – or standing still giving us the beady eye – going fast was not an option! And the food – what’s a restaurant with out good food? At Larkins, it was a mixture of traditional popular dishes (great prime rib, a Spinach Artichoke Dip, or Baby Back Ribs) with more modern classics like Sesame crusted Tuna Tataki. And best of all – they had my favorite dessert – in their case it was called Hubba Bubba Brownie – but basically it’s a brownie, vanilla ice cream, whipped cream and chocolate sauce. Oh man – I could diet forever to have one of those! I had the prime rib one night – rare, perfectly cooked, super tender – and the 2nd night I opted for just an appetizer of the Tuna Tataki – nice size portion, Tuna was perfectly rare on the inside and nicely seaseme’d on the outside. Yummy. And the service was warm, friendly, and personable. The second night, our waitress from the first night totally remembered us – and told our wait person exactly how to get us what we wanted. I haven’t had that kind of service in – well – ever! And prices were quite reasonable for a tourist locale – from just $17 to $30 dollars per person – in a setting you will never forget. My kind of perfect place.